Green zoisite clears and stimulates the chakras, particularly the Heart and with it the lungs, as well as the body’s energy field, removing unwanted/unhealthy energy and clearing it out through the legs and into the Earth. 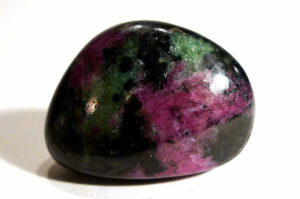 The Heart is affected wherever the zoisite is held, but for other chakras, it may be necessary to place it on or near the area for best results. The energy tends to be a bit ‘fizzy’, and this might be slightly uncomfortable to the client/user, but the end result leaves one more awake, alert and clear-headed. 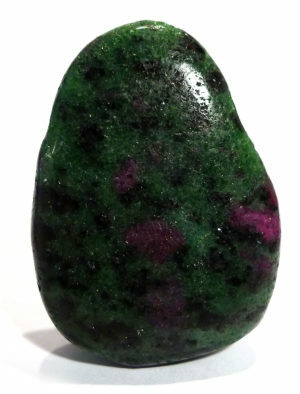 In conjunction with ruby, this stone is one of the supreme Heart and immune system balancers, and is beneficial in the treatment of autoimmune diseases, and illnesses in which the immune system is compromised, such as ME and CFS. 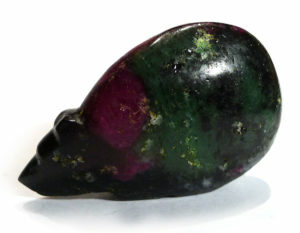 This material is massive and often forms with black or green pargasite crystals, and in association with ruby.